‘Yalla yalla’ – Lets go, Lets go! First things first, I must once again apologise for being a bit preoccupied recently. At one point I actually thought I’d lost my ‘foodie mojo’. But it is back, with a vengeance and I am once again raring to go!! On Friday evening I caught up with a uni friend and to our surprise we actually managed to cover quite a bit of area, hopping from one place to the next. Whilst the majority of our evening was truly unplanned, we did however decide in advance on our dinner venue. As a self-proclaimed foodie, I had picked a place that I’ve been meaning to try for some time. We rolled up at Yalla Yalla in Green’s Court without making a reservation. Turns out we were either very lucky to have been seated so quickly, or someone somewhere wanted me to finally have a taste! Both myself and Miss M questioned if we had jumped the queue when we were promptly hailed inside by the waitress who had only 10 minutes previously bought us our ‘Zahra Lemonades’ and told us there was an approximately 30 minute wait. The restaurant itself is rather quaint. This branch was the first location set up by the Beirut born Chef and his Polish partner and seats a maximum of 28. The rustic wooden tables and stools make for a non fussy atmosphere. By the rush forming outside it is instantly obvious that the food must be pretty good. Being a ‘vegetarian day’ for me, we ordered a number of veg meze. Miss M had read that the Hommos was particularly good (my foodie influence rubbing off)! The Hommos came first. Served with traditional flat-bread it tasted almost home-made. Nice creamy consistency, not to tart, definitely a good Hommos. Next in line was the Halloum Meshoue. Now I have to say I’ve had Halloumi cheese in a number of different Lebanese and Turkish restaurants and there is obviously an extremely fine line between just right and over done. 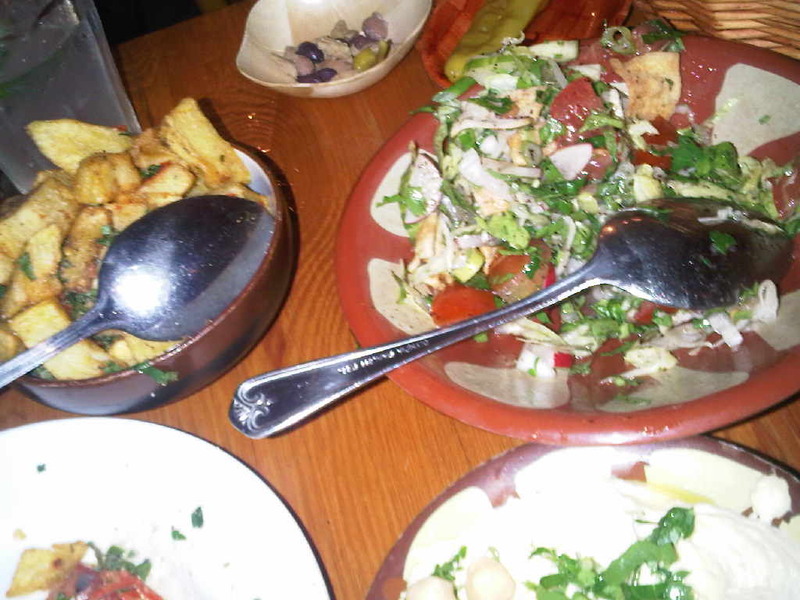 A lot of restaurant’s seem to serve it slightly over done, BUT Yalla Yalla served it perfect. Ok so maybe that sounds a bit OTT, but seriously, the Halloumi cheese was soft and creamy and not at all chewy or salty, in fact it melted in my mouth! The Batata Harra was served next. These in my opinion seemed slightly over fried, unless the other restaurants simply serve their Batata Harra soggy! Given my experience with the Haloumi Cheese, I wouldn’t put it past them! Myself and Miss M discovered that the Batata Harra dipped in the Hommos was extremely yummy! 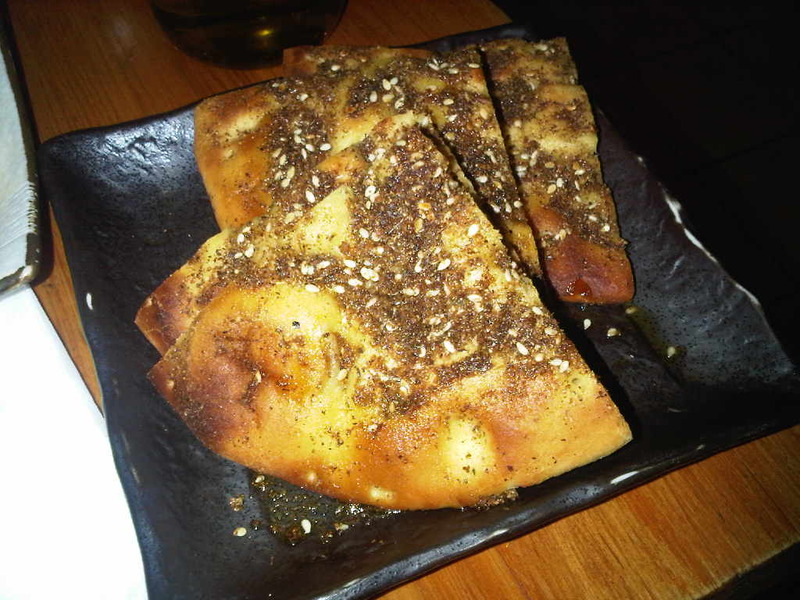 Last up was the Zaatar Bread. Now I have eaten a fair bit of Zaatar Bread in my time, This was good, but in my opinion the bread base was possibly a little too thick and was therefore a little too bready for my liking. Make the base slightly thinner and this too would get a thumbs up from me! Overall we were extremely impressed with the food. Given that the team now have a second outlet on Winsley Street, I thought the food would be a little more mass-produced but instead we were greeted by a truly authentic taste of Beirut street food. If the standards are as high as the original branch, I think we’ll be seeing a lot more Yalla Yalla’s popping up around London! I will most definitely be going back to savour the meat dishes, so keep an eye out! Greetings. We are attempting to link your posts to Urbanspoon, but the Spoonback code is not publishing correctly (as indicated by the widget not linking to Urbanspoon). Can you attempt to repost the code exactly as it appears on our site, and let us know when you have done so. Thank you. Hiya, I posted the code as on the site but the image failed to appear, so I removed ‘<a href="' and ‘/>‘ from the end. The urban spoon image then appeared. Please let me know if Im doing something wrong!